Clinician Biographical Information Dr. Alexandra Zacharella is assistant professor and director of bands at the University of Arkansas-Fort Smith. She received her doctorate from the USC Thornton School of Music in trombone performance, and minors in conducting, music education, and jazz studies. She also served as a teaching assistant for the music education department and the Thornton Wind Ensemble under the direction of H. Robert Reynolds. 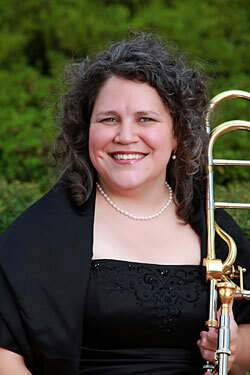 She holds bachelor degrees in trombone performance and music education from The Hartt School at the University of Hartford, and a master’s degree in trombone performance from the University of Michigan, where she also served as a graduate teaching assistant in music education. Zacharella is an active chamber and orchestral musician performing with various brass ensembles and symphony orchestras.